It was another nice week of new releases with a new title from Tin Man Games, a fun point and click adventure port, a stylized golf game and lots of puzzle games. First up is Heart Star, a puzzle adventure game with a twist that comes to us from Jussi Simpanen (Super Dangerous Dungeons, Duke Dashington). 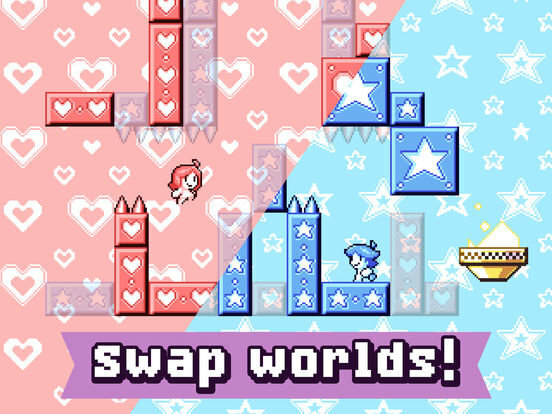 Switching between red and blue worlds you must help a pair of friends reach the goal. However the trick is that the blue character can only move on blue platforms and the red only on red platforms. And only one of these colors can be active at any given time. When you switch active colors, the platforms of the other color go inactive and disappear. This means you will have get the two characters to work together, sometimes carrying one another or using the other to reach higher areas to have them both reach the exit successfully. It makes for some really interesting gameplay and will require some creative thinking on how to best position, combine and complement the characters. Twins, Tom & Lily are searching for their lost parents, however finding them will be difficult since the twins always move simultaneously. If Lily moves left, so does Tom. If Tom moves right, so does Lily. 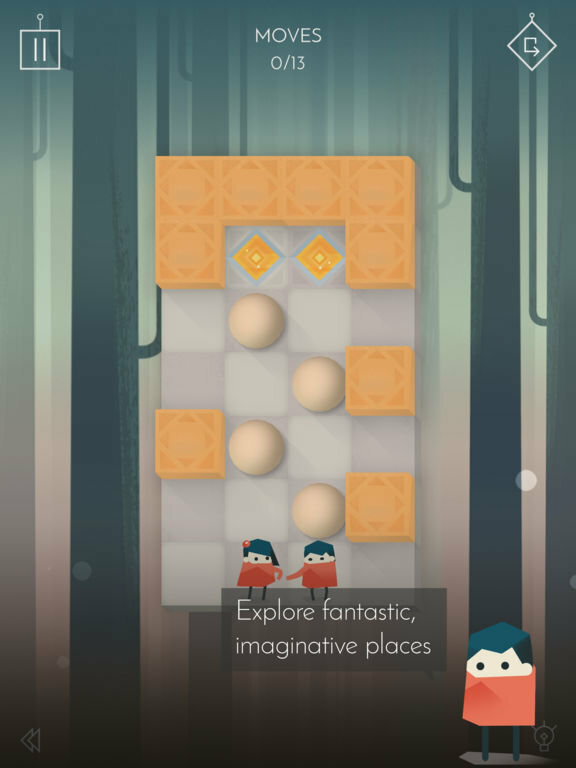 Using the correct sequence of swipe gestures, you must guide Lily and Tom safely to their respective exits in each level of this top-down puzzle game. 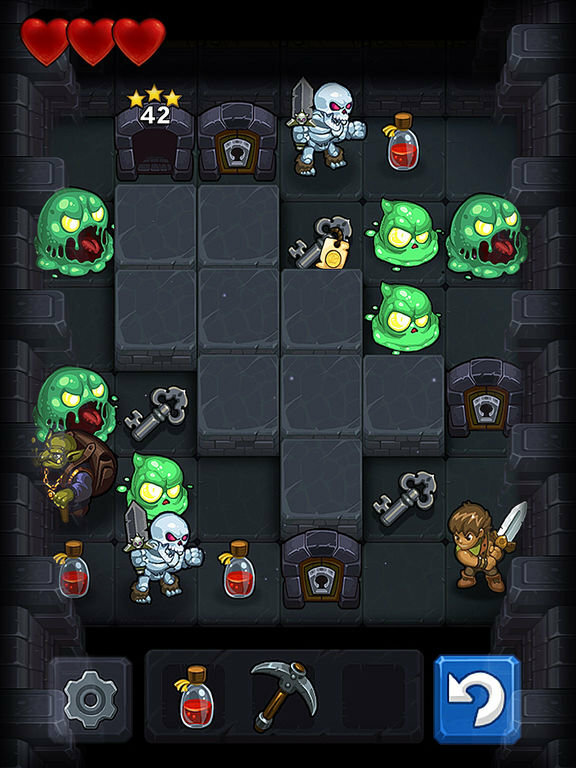 While Link Twin game is certainly not the first to use this “move two characters simultaneously” mechanic (there was Naquatic’s 2015 title Staying Together among others), it is still a well-polished and nicely illustrated puzzle game with some formidable levels and neat mechanics that shake things up and increase the difficulty as you progress through over 100 levels. For me, the simple swipe-based gestures make it more approachable than the aforementioned Staying Together and the fact that Lily and Tom move simultaneously, arguably makes it more challenging and tense than Heart Star. I think if you are someone who likes the challenge of these order of movement style logic puzzles, where you are trying to minimize your number of moves, then you’ll enjoy the challenge of Link Twin. Speaking of “order of movement style logic puzzles”, that’s exactly what Crescent Moon Games’s latest offering Maze Lord is all about. In some ways, the game is fairly similar to last week’s Warlock’s Tower, however I have found CMG’s offering to be much more interesting and expansive. In each dungeon you are trying to make your way through a series of monsters and locked doors to reach the exit. The floor of the dungeon is laid out in a grid and each square you cross counts as one move; the goal being to reach the exit within a certain number of moves (or you must start over). You begin each level with three hearts. If you land on or pass through a square with an enemy, you’ll fight them and lose a heart; if you lose all three you are dead. Fear not, there are squares with health potions that can restore a heart as well. this means you must navigate the dungeon in such an order that you pick up these potions to replenish yourself along the way and/or pick up keys to unlock doors. Since you have a limited number of moves, planning out your path is critical, lest you waste valuable moves unnecessarily backtracking. As the game progresses new elements are introduced, from dangerous new monsters with different behaviors, to a merchant who you can sell keys and potions to, in order to get coins to buy other keys and potions positioned further into the dungeon. These all work to really ratchet up the challenge and make for some rather difficult levels, and head scratching fun. From Big Bucket Software (Space Age, The Incident) comes a sort-of reverse platformer called Stagehand. Instead of a traditional platformer where you would take on the role of the protagonist, jumping from platform to platform, dodging enemies, pitfalls and more, instead you control the STAGE itself. Using your finger to rapidly move the platforms up and down to create a safe pathway for our constantly forward moving hero Frank to keep from falling or running into other nasty traps. 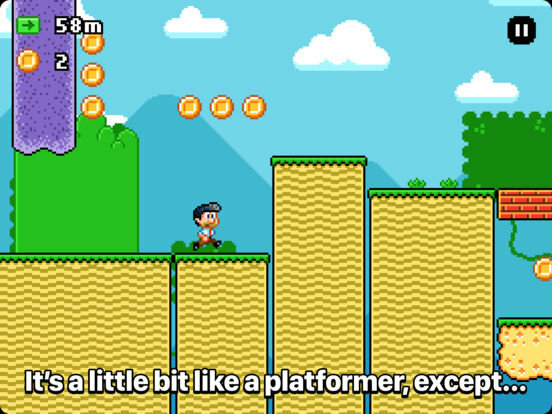 Flinging platforms upward quickly almost acts like a jump button in a traditional platformer, allowing you to cover more ground and create a little bit of a buffer. Where the game really gets you is when you have two switch between dragging up and down platforms. It is fast-paced and challenging and if you lose your concentration or hesitate for even a second, it could mean game over for poor old Frank. While runs are randomized and procedurally generated, I would have liked to see a little more variety in the stage, perhaps to play homage to a number of different classic platformers instead of just Super Mario Bros.. While this is not the first time we’ve seen the ‘control the level, not the character’ mechanic used in mobile games (Bumpy Road comes to mind), Stagehand is a tough, well-executed, quick playing high-score driven game theat will probably appeal to endless runner fans. A little bit of a departure from Tin Man Games’ usual Gamebook titles, the newly released, Miss Fisher and the Deathly Maze is hopefully just the first of many titles we’ll see in this new series of interactive novel/deduction games set in the Miss Fisher Murder Mysteries universe. For those of us not residing in Australia, Miss Fisher’s Murder Mysteries is an Australian dramatic televisions series (based on a series of novels by author Kerry Greenwood). Set in Melbourne during the roaring 20s, the series revolves around a convention-breaking, glamorous and free-spirited female detective named Phryne Fisher, her young assistant Dot, a police detective Jack Robinson, Dr Elizabeth “Mac” Macmillan, Miss Fisher’s staunchy Aunt, loyal butler and her Nemesis Murdoch Foyle, who she blames for the disappearance of her sister. The mystery presented in Miss Fisher and the Deathly Maze is not based on a pre-existing tale but instead a brand new original story written by the Tin Man team using the characters and their likenesses from the TV series. 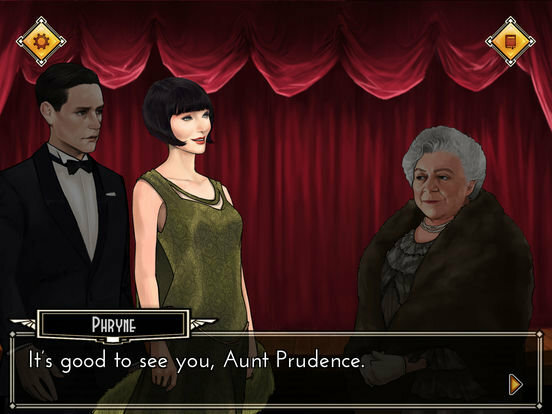 This game puts Miss Fisher on the trail of a murderer who killed an actress on stage. You help solve the crime by interviewing suspects and witnesses, finding clues (and grabbing more fabulous outfits to wear). As information about people and places and clues are found the information is entered into (or updated) in your notebook. You can travel between locations at will to collect more info until you are ready to deduce (by combining two pieces of evidence together). This aspect of the game had an Ace Attorney kind of vibe to it. I wouldn’t say that Miss Fisher and the Deathly Maze – Ep. 1 is necessarily challenging; Despite having free will to travel where you want, talk to who you want and search whatever you want the correct path forward is always fairly evident, but that’s not necessarily a bad thing. It just gives the game more of the air of interactive episode of a TV series which is both engaging and entertaining, making you feel like you’ve been transported back to this rich, scandalous 1920s world. Before starting this game, I had never seen the TV series, so I quickly remedied that with a visit to my trusty Netflix queue. Don’t get me wrong, you can fully enjoy the game without ever having seen the series, but after watching some episodes, it is easy to see that Tin Man really nailed the character likenesses in the gorgeous illustrations as well as their “voices” (via dialog) and the mannerisms of the characters. I quite enjoyed the experience from the jazzy opening credits to the cliffhanger of an ending and I certainly look forward to assisting the incorrigible Miss Fisher on her future cases. Released on Steam last year after a successful Kickstarter campaign Nelly Cootalot: The Fowl Fleet (sequel to 2007’s Nelly Cootalot: Spoonbeaks Ahoy!) is a brilliant, smart and funny point and click adventure game from award-winning stand-up comedian Alasdair Beckett-King. It follows the misadventures of a Pirate girl named Nelly Cootalot as she tries to track down her nemesis, the villainous Baron Widebeard and recover the Treasure of the Seventh Sea. During her quest, Nelly encounters a crazy cast of characters including talking birds (one of whom is voiced by many people’s original Doctor… Tom Baker), pirates, ship captains and more, resulting in some truly hilarious dialog exchanges. As a long-time fan of point and click adventures, I found Nelly Cootalot to be quite delightful. It reminded me a lot of the classic writing, art style the Sierra Online and Lucas Arts games of my youth and the great voice actingbrought the characters to life. Occasionally I did have a couple of issues when trying to use and/or dropping items but overall, the touch screen controls worked well and it was nice to have the ‘?’ button to quickly see all of the possible interactive points on the screen. A bit of a departure from their usual fare, Nelly Cootalot: The Fowl Fleet is published by Application Systems Heidelberg Software GmbH, the studio behind the excellent digital board game adaptations of both 6 Takes! and Café International. 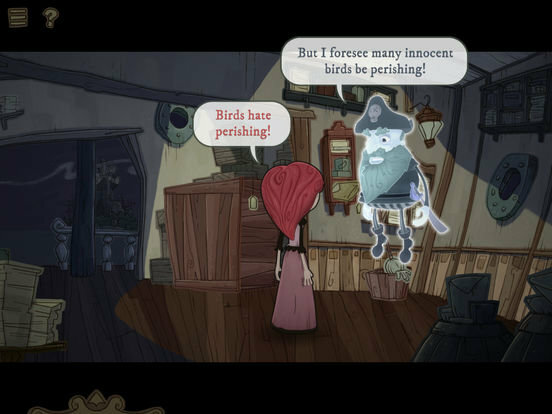 If you enjoy classic point and click adventures and/or British humor, then I think you’ll find a lot to love about Nelly Cootalot (even the trailer is entertaining!). 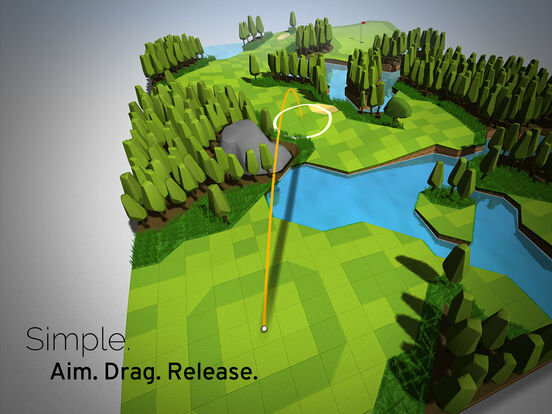 OK Golf is a visually stunning, minimalist new golf game where each hole is set up like a 3D diorama. If you think the game’s visual style is a bit reminiscent of Hitman GO and Lara Croft GO, this could be because the game is developed by Okidokico Entertainment Inc. (Super Boost Monkey), a small Montreal-based studio founded by two veteran developers with experience from studios including Ubisoft Montreal and Square Enix Montreal. OK Golf breaks gameplay down to a simple slingshot mechanic where you aim, drag back and release to hit the ball. There is no club selection and if you want to put a little more oomph on the ball you just drag back further until you see the longer orange shot line appear. There are several modes of play from normal stroke play, championship play and a the more stressful timed mode where you attempt to complete the course within certain time windows to earn one two or three stars. In stroke play you can play and re-play individual holes with a birdie or better earning you three stars, par gets two stars and anything else earns one. At launch the game comes with four 9-hole courses with the promise of more on the way. The holes are nicely designed in that there are multiple ways to approach the green and with creativity you can discover new paths that allow you to shave strokes off your game. There seems to be a little glitchiness when it comes to rotating and zooming the course, and the roll of a hit ball seems a bit inconsistent, but neither of these small gripes are enough to detract from the fun of the game. That’s all I have for you this week..enjoy!